Fields of Blood: "Start the Panzer, Mr. Whiskers"
This weekend is going to see me give my proposed Runefang IV list a run for the first time. As previously blogged this is a departure from my regular Skaven list in that it has no shooting (bar the Enshrouding Fog) of the Plague Furnace. It has been dubbed the “Skavenblight Panzer Division” given its three large targets – Bell, Furnace and Hell Pit Abomination. So what do I see as the challenges in the list? Well first and foremost, it reinforces one of the inherent weaknesses in the Skaven list, the ability to finish units off to gain Victory Points. Without Gutter Runners and Engineers that finishing power is greatly diminished, requiring the enemy to be beaten and “harvested” in the Close Combat phase. Secondly, it removes one of the big damage-dealers that Skaven have to weaken stronger enemy before combat ensues – template weapons. 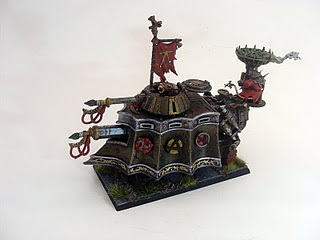 Part of the strength of the Skaven list is its access to templates be it the Doomrocket, Warp Lightning Cannon and Plagueclaw Cataput, and to a lesser extent Poisoned Wind Mortars and Warpfire Throwers. This leaves only the “Scorch” spell to deal out template death. Without the ability to weaken enemy units before combat I doubt that the core Skaven units have the necessary resolve for the task over a sustained period. A lot of responsibility therefore falls on the heavy hitters. I’ve got more than the normal sense of trepidation about the likely success of this build. However it should be fun to try out. I’ll let you know how I get on next Monday.